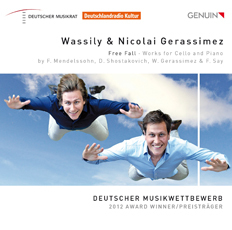 The title Free Fall that the Gerassimez brothers have given their duo CD debut on GENUIN could also be poetically modified to: "Only flying is more beautiful!" Once again, this is one of those meritorious productions created in cooperation with the German Music Council following the German Music Competition – young, highly talented musicians just being launched on a great career. In this case, a cello-piano duo offering something new alongside Mendelssohn Bartholdy and Shostakovich, including two compositions by the cellist himself: brilliantly performed, technically perfect and with great ease. Quite a takeoff!